Riedel Crystal was first established in 1756 and since then has grown from strength to strength. It is now a famous name in the glassware industry used by wine experts and restaurateurs around the world. You are guaranteed high-quality glass products. Wineware are one of the largest stockists of Riedel in the UK – orders are normally dispatched from our UK Warehouse within 24 hours of placing your order, Monday to Friday. We offer a vast selection of Riedel products and ranges, from the first ever grape specific Vinum range, to the popular handmade Sommeliers range. We also stock a large collection of Riedel’s finest Wine Decanters too! So what makes Riedel’s stemless wine glasses popular? We can of course let you know why the Riedel O Range is so popular but one way to find out (and know for definite) is to try this collection. We cannot recommend this enough and we guarantee you will be pleased with the results. Eye-catching – the O Range is both captivating and unique. Your guests will be impressed with your glass collection and will be unable to take their eyes off your glasses. The first – Riedel’s O Range is the first varietal specific wine tumbler in history! Reliable – the O glass is based on the benchmark shapes of Riedel Vinum. Practical – so what do we mean by this? Yes the glasses are functional and can be used for serving wine, spirits, soft drinks or water but they are also ideal for everyday use as well as for an occasion. An all-round adaptable glass. Broken stems are no longer a cause for concern. Fine-tuned – these glasses have been specially designed to enhance the world’s most important grape varieties and types. You can have peace of mind that your wine will not only look great but taste great too! From being an all-round drinking vessel the O Range glass is now a sophisticated and much loved wine accessory. Benchmark – mutter the word “Riedel” and most will know this company as the benchmark in wine glass shape and size. They are renowned for changing the quality of your wine drinking experience. Loved by many – okay, so strictly speaking this isn’t exactly a reason but a fact. One we had to sneak in. Sommeliers and wine experts around the world love Riedel and for good reason too. 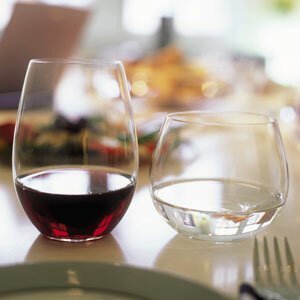 The team at Wineware are also proud owners of Riedel glassware and know just how good it is. A glass that works. Stemless wine glasses are a modern touch to any glassware collection suitable for home or commercial use. Please see 'stemless vs stemmed wine glasses' for more information. Speak to one of our advisers on your Riedel glassware purchase or about the Riedel stemless wine glass range. We can advise you on the best option. Call us now on 01903 786148 or fill in our online form. Alternatively please see our ‘Which Riedel wine glass to choose’ for more information.